With the upcoming U.N. Climate Conference starting in a few days I wanted to follow up on Santa Fe’s Flash Flood, the human art event that I wrote about in my last post. The Flash Flood was one of 18 global events sponsored by Earth.350.org to bring attention to climate change that were filmed by satellite and will be shown at the Climate Conference. In some places the event also brought more attention to a local, climate induced change, in Santa Fe it was the endangered Santa Fe River. 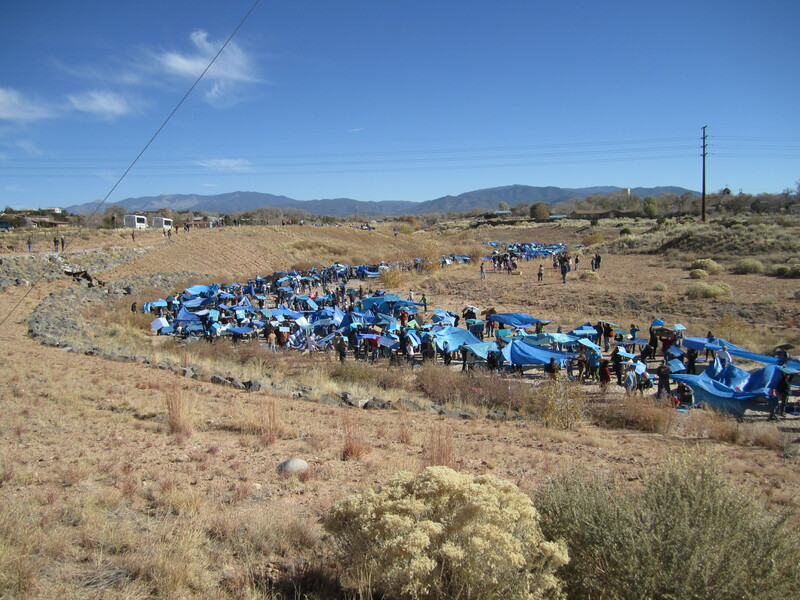 The Flash Flood was in many respects a success, although turnout was not what had been hoped for there still were over a thousand people in the dry river bed creating a human flash flood. This is what it looked like from the ground. 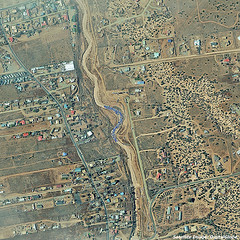 From the satellite photo of the event you can see what the dry river bed would look like blue, as if the river was flowing, at least for part of the river. Here is a link to see more satellite photos of the all the 350.org eARTh Art events. Climate change is not something that is hypothesized to happen in the future…it is happening now. I don’t know about you but I have noticed a change in the weather and in really significant ways. I lived in Germany for a few years and I had heard for years abut how awful the weather was, especially in the winter. But in fact the weather was quite mild and when I would ask people who had grown up there about it they always would say, oh yes it used to be really horrible but it is better now, maybe global warming is making it less cold and grey. Not that I am endorsing climate change as a way to improve the weather in some places, but this is significant. We are literally witnessing a major natural phenomenon before our eyes, and not a positive one when we consider the bigger picture. It might be good news for some but for others they are literally losing the ground beneath their feet. It seems we often read or hear about small islands being threatened some time in the future, but right now, in the U.S. people are being directly impacted by rising sea levels. Friday’s New York Times had a cover story about Norfolk, VA and how some locals are having to change their daily routines as the tides rise into their roads and yards, as well as the solutions that the city is trying to find. But if we do not reverse this trend any solutions will only be temporary as tides continue to rise as temperatures do. As more of us realize how urgent this situation really is we will join forces and be able to make a greater impact for reversing these frightening trends. We are actually changing life on earth as we have known it, as we alter the face of the planet, the atmosphere and the oceans. It is up to each of us to act now to make a difference towards positive change. Businesses and politicians will follow our lead. Each dollar that we spend should be a reminder of the power that we have. Where and how you shop makes a big difference. For example, when enough people let it be known that they did not want milk with growth hormones Walmart actually stopped carrying milk if the cows had been injected with rBGH, the bovine growth hormone. This actually led to Monsanto selling the division that produced this hormone. Unfortunately a pharmaceutical company bought it and it continues to be used (you can read more about this scary, and a bit crazy, situation where the company who bought the rights to the growth hormone, which has been implicated in causing cancer, also produces drugs to treat cancer). The more we let companies know that we will not buy any products with the hormone, it will be used less and less. It is banned in many countries already. You will find a partial list of products that are still using it if you want to avoid it. I must confess I was really sorry to see Hagen Dazs on the list, but there are lots of delicious alternatives, even some without dairy like Coconut Bliss-trust me you won’t miss the milk and you might even start preferring this delicious, organic, non-cream ice cream. We do make a difference and getting Walmart to change their buying practices should empower us to speak up more to let businesses know what we want and what we don’t want. So remember that climate change is something that is happening right now because of the fuels that we use, the way that we generate electricity, the way that we grow food and raise animals, and many other reasons but each of these can be changed and are being changed…we just need to speed these positive changes up to out pace what we have been doing for a long time now in order to reverse things. One organization that is working to bring people and many organizations together is Four Years Go-4YG, founded by the Pachamama Alliance, you can read more about their work here. So get active and shift what you can in your own life (and the lives of your family and friends). Speak out about what you want to see handled differently. We can turn this around together so that we are living in a smarter way.